If you asked one hundred people which sport was the most dangerous to your teeth, swimming would not be one of the top answers. It’s much more likely for people to name a contact sport, like hockey, basketball, or boxing. Getting hit in the mouth during one of those sports can definitely take a toll on your smile, but swimming is a surprising source of tooth damage. 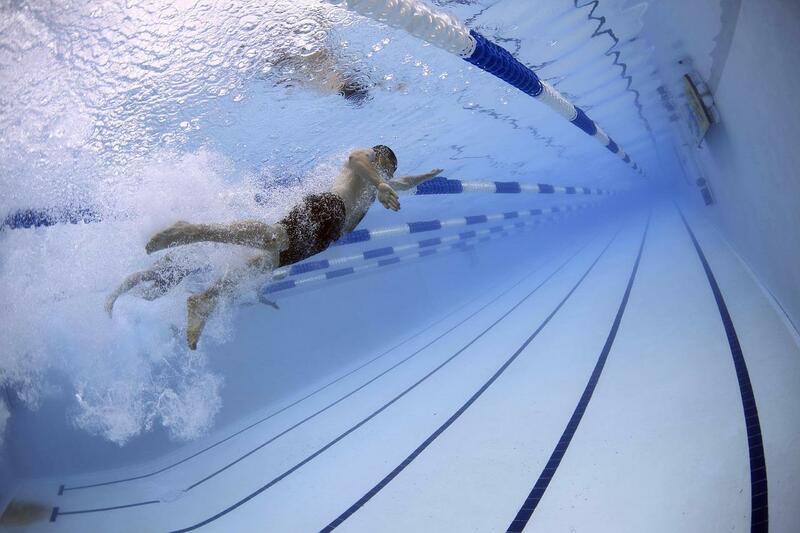 Swimming is popular with fitness enthusiasts because it’s considered one of the healthiest sports available. It is low-impact, allows you to build strength and get your cardio in at the same time, and recruits upper and lower body into a comprehensive workout. Experienced swimmers will also tell you that although it’s not exactly a contact sport, it’s easy to take an elbow or hand paddle in the mouth when your lane is full. If you play contact sports like water polo in a chlorinated pool, you should definitely have the dentist on speed dial. If you’re a swimmer or triathlete who spends a lot of time in the pool, you know that chlorinated water can be hard on your hair. But you should also be aware that the chlorine can cause long-term damage to your smile. The chlorine that is keeping the water safe to swim in breaks down salivary proteins more quickly than they would otherwise. As they break down, the proteins form organic deposits on the enamel, leaving behind a brown residue. Not only is the brown residue unattractive, it eventually wears away the enamel, leaving your teeth brittle and discolored. As the decay advances, the brown residue hardens, and teeth become more sensitive to hot and cold. The accelerated effect of the chemical reaction causes faster decay on your teeth than normal, leaving you vulnerable to cavities, chips, and cracks. Dentists call this condition swimmers’ calculus. Chlorine is added to pools and hot tubs to kill germs. As swimmers add urine, perspiration, body oils, and lotion to the water, more chlorine is necessary to keep the water clean. As the chlorine reacts with the other substances in the pool, it produces chloramines. It is this byproduct of the chlorine mixing with substances added by swimmers that acts as an irritant to swimmers, producing red eyes, rash, and the overwhelming smell. Modern pools use UV systems and ozone to help sanitize the pool and reduce the amount of chlorine necessary. All pools use chlorine in some capacity because the chemical is extremely effective at killing germs that cause diarrhea, swimmer’s ear, and various skin infections. It would make sense if chlorine bleached your teeth in the same way that it bleaches clothes. You most often hear about it being used to lighten colors. But the chemical reaction is more complex than simply one that lightens or darkens everything it touches. One of the factors determining how chlorine affects your teeth is the pH level of the water. The chemical components of chlorine vary based on the pH level of the pool. Ideally, the level of pH in your swimming pool should be 7.4, which is the same as human tears. Chlorine causes the most harm to teeth at low levels of pH. When the pH level in the water dips below 7.0, it is the most damaging. The lower the level, the more damage it can cause. If you spend more than six hours a week training in chlorinated water, see your dentist for recommendations to minimize damage. Rinse and spit with clear water before and after entering the pool. Avoid sweetened drinks while training, such as sports drinks, as the sugar will feed the bacteria causing the damage. Swimmers who train year-round should see their dentists more often than twice a year for tartar and stain removal because the calculus will continue to accumulate with constant exposure to chlorinated water. If your insurance doesn’t cover additional visits, look into low cost dental care from ED USA so that swimmers’ calculus doesn’t progress to gum disease. With proper care and hygiene, you can minimize the damage to your teeth from the pool and keep your smile sparkling bright. Swim at a pool with a UV or ozone cleaning system that augments the chlorine usage, or one that enforces strict hygiene rules requiring swimmers to shower before entering the pool. Avoid swimming in an older pool with less sophisticated decontamination equipment, because the pool manager will have a harder time controlling the pH balance and chlorine levels. See your dentist often and ask what other actions you can take to keep your smile bright and healthy.